Indian Railway is introducing the facility of booking unreserved suburban tickets on smartphones. The application has been developed in-house by Centre for Railway Information Systems (CRIS).The passenger has to book the ticket in the mobile phone and print the ticket on the ATVMs installed at the journey originating (Source )Station. 1. First the passenger will get registered by providing his/her mobile number, name, city, default booking train type, class, ticket type, number of passenger and frequently travelling routes. 2. Upon successful registration, Railway Wallet (R-Wallet) will be created automatically with zero balance to the passenger. There will be no extra cost for creating R-Wallet. 3. The passenger can go to any of the UTS counter to recharge their R-Wallet. 4. Currently, booking is enabled from Dadar (DR/DDR) stations to all suburban stations of Central and Western Railways. The Source station list will keep on increasing day by day. 5. The passenger can book ticket through the mobile app. On booking of ticket, he/she will get Booking ID along with other ticket details. The booking details will also be available in booking history. The booking ID will also be conveyed through an SMS. 6. After this, Passenger can go to the journey originating (source) station to take ticket print out from any of the ATVM there, by entering his/her registered mobile number and booking ID. The Journey is valid only with printed ticket. The passenger will get confirmation message with ticket information, along with unique booking ID and he/she will be asked to print the ticket at the station using ATVM Kiosk. The passenger will be prompted to save this ticket information in Frequent Travel Information(FTI) in case the route is not available in the passenger FTI profile. Subsequently, the passenger will get a text message with ticket information as SMS and IRCODE. Mumbai Suburban: The passenger will not be prompted for Train Type because Suburban tickets are allowed only in Ordinary Trains in Mumbai. Chennai Suburban: The passenger will be prompted for Train Type. The allowed Train Types are O- Ordinary, E-Express, S- Superfast. How many days we can book the tkt in adv? 1) when this facility will be available for all stations like irctc ticket? 2) will telescopic ticket be available through mobile? its UTS Mobile ticketing available any where. but booking before register in new account. I booked an local ticket through UTS app. For how many days that ticket is valid? I did booking today, can I take its printout a month later? And on which all stations ATVM facility is available? please check ticket valid on back, if it valid take print. Its ticket process Already Done, Every ticket details sends to mobile(booking time given number), that tickets show it directly to the tc. How is it paperless ticket if it is compulsory to take ticket printout? I did recharge my wallet through online and the process failed but my amt has been detected from my bank acc. How can i get it back? I need to book sub urban ticket. How many days before can i book the ticket? I am from Chennai The SMS received after booking ticket on UTS app says, “Journey is valid with printed ticket only”. But I read in the news recently that it is enough to show the ticket on the phone. Please confirm what is the right procedure. When can we expect this App for iphone users ? Kindly make a option to show ticket from app to the checking inspector. As of now taking print out is compulsory. That does not make taking ticket easy. After booking from app one has to go and take print out. Also the “Show Ticket” option is not working. Kindly include the option of paperless ticket also. Otherwise it’s of no use. It’s said that after booking a ticket from UTS Mobile App. print out is compulsory from ATVM. If all ATVMs would out of order in a station, what could I do then. Sir, Today morning i was trying to book M-ticket (from chennai-Guindy to Tambaram) i was successful and got M-ticket on my mobile. When in the afternoon, i was trying again to book M-ticket (from Tambaram sanatorium to Chennai Beach) i got only PAPER-TICKET. Any specific reason for this? How to change registered handset for UTSONMOBILE? I lost my old device. .when I try to login from new device of same number it is asking me to login from old device. .pls help..
it says to “login using the registered handset”. Not able to cancel my account also. I had upgrated my device. .when I try to login from new device of same number it is asking me to login from old device. .pls help..
. .when I try to login from new device of same number it is asking me to login from old device. .pls help.. Same problem. ” login using your registered handset” how to change registered handset??? Hi please help on how to change the registered handset. 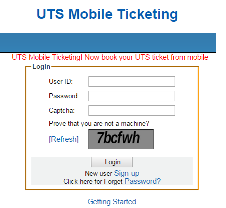 I have registered with uts ticketing site but while logging on through the uts mobile app says to log in using a registered device . How to change handset request? How to change handset. ? Money had been debited from account, however it is not reflecting on my mobile wallet. Kindly advice on how to get my wallet updated? When i am trying to Book My Western Railway Ticket, the app is asking for high gps Signal strength for booking the ticket but i am already in the open area and also in the station pls help. U can contact ticket booking clerk. Give him your registered phone number n money to upgrade your R wallet. What is validity of R wallet. Cannot login from the same device after giving request to change device, R Wallet balance is there , Kindly help. required feed back, all station is not covered,via option required for booking. Sir when can we expect UTS mobile will be available for IPhone ? Why there is no availability for monthly pass ticket. please make it for iphone. When It will available for iphone ? please lets us kno . Hope there is an iPhone UTS app on the way. When it will be available for ios devices? hi i am unable to use UTS mobile App on my new handset as my old mobile is not functioning. i have also sent a mail mentioning the IMEI no of my new mobile handset to this email id: utsmobile@cris.org.in. please help me out.